LEN - www.lankaenews.com | UNP ready for a separate government ! India and US express consent !! 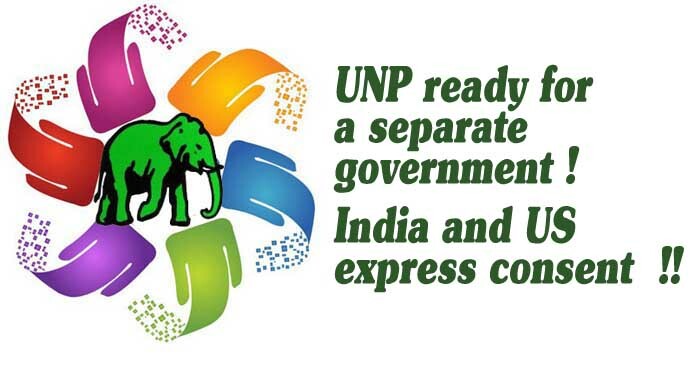 UNP ready for a separate government ! India and US express consent !! (Lanka-e-News - 05.Jan.2018, 10.30AM) The UNP led United National Front (UNF) has focused its attention on forming a separate government after the conclusion of the forthcoming provincial council elections sources close to the UNP revealed. India and America too have expressed their consent to that. If the UNF receives 50 % of the votes cast at the provincial council elections , the UNF forming a separate government is certain. On the other hand even if the SLFP’s Maithripala group which has now taken refuge under the consensual government of the UNF (with UNP as the main constituent Party which secured 50 % of the seats ), is to drop to third or fourth position , the UNF will still be forming its own government , sources pointed out. The second row UNP leaders had exerted huge pressure on the leadership to form a separate government and the other leaders within the UNF have also given their consent to this. This is mainly because president Maithripala after reaching that position on the votes of the UNP conducting himself as an ‘opposition president’; impeding every progressive step taken by the consensual government ;and lately , even descending to the lowliest level of violating the constitution to the detriment of the entire country . Maithri transgresses even the constitutional provisions ! The case in point illustrating this is the appointment of Piyasena Gamage who recently replaced Geetha Kumarasinghe , as State minister of law and order . Under the 19 th amendment to the constitution the president can appoint ministers only with the recommendation of the prime minister. Despite it , unbelievably , this controversial appointment of a fraudster has been made without even the knowledge of the minister in charge or the P.M. This outrageous controversial action of the president not only violates the constitution but even the ethical norms of the consensual government . Moreover ,Gamage is one who defaulted on payment of water consumption bills , and a goon who assaulted journalist Daya Nethasinghe meaning that he doesn’t deserve at all the law and order state minister post. Even prior to this , the president stood in the way of the decisions taken by the government and deliberately caused delays , whereby the activities of the government were hindered. This was best illustrated when the president deliberately opposed the proposal in the budget passed with a two third majority in parliament , to increase the price of lottery ticket by Rs. 5. 00.Owing to this , not only the Lotteries board that is run on the lotteries earnings ,even the Mahapola scholarship fund geared for the welfare of the nation were plunged into grave difficulties. After the recent budget was passed , minister of finance Mangala Samaraweeera had occasion to severely castigated the stupid objections raised by the president, such as the launching of the shipping Co. and downward revision of Beer prices. The president had tried to effect changes to these decisions even after the budget was passed. Maithri who antagonized friendly countries .. The braggadocios of the president whenever he is with the SLFP stalwarts that ‘ what Mahinda Rajapakse could not , I can . I shall make UNP to come to me kneeling,’ are of no consequence and of little value knowing well the hollow and shallow qualities of the president . Hence UNP has no need to worry over those empty boasts. However the grave deceptions practiced by the president on America and India merit serious consideration. It is worthy of note that the smuggling out by SL president of the notorious Russian hacker to Russia on whom there was an Interpol warrant and wanted by America , had incurred the bitter resentment of America which is taking a firm stand against it. Similarly , India too is offended by the action taken to oust former Navy Commander Travis Sinniah who earned the admiration of India , two months after his appointment . It is while India most appreciated the measures taken by Travis over the issue revolving around the Indian Fishermen, Travis was removed from the Navy Commander post at about the time India expressed its approval to our president of the efforts of Travis to resolve the Indian fishermen issue . No matter what , the two countries America and India which directly make an impact on the fate of Sri Lanka have not expressed their opposition to the United National Front leaders with regard to UNF forming a separate government, based on reports reaching Lanka e news. These countries are of the view what exists in Sri Lanka now is not a consensual government but rather a dual government . A dual government cannot be progressive ,and foreign countries cannot have dealings with such a country. Meanwhile the pact signed between the two parties of the consensual government terminated in 2017. Maithri has no moral rights…. Based on reports of the provincial correspondents of Lanka e news , it is the belief that the Maithri group , in the present political climate is even below the JVP in popularity in the villages in relation to the local body elections. In any event , if the Maithri SLFP faction that is with the consensual government secures second place , it has a right to remain with the consensual government . However if it does drop to third place it has no moral right to be with the government , in which case even the president’s moral right to remaining in his post is dented. On the other hand if the Maithri group drops to fourth place , the president should resign with immediate effect , and moral rights issue is out of the question . If he does not , the president who came to power on the solemn promise to the people that he would abolish the executive presidency within 100 days and failed ; made his daughter , brothers and son in law billionaires within two years of his reign and seeking to become another Medamulana ; became a traitor even before 48 hours elapsed after becoming the president by betraying the forces led by Ven. Maduluwawe Sobitha Thera that propelled him into power ; obstructed the investigations into the murderers and crooks of the corrupt nefarious decade; and from whose mouth a lie never fails to drop each time he opens his cavernous mouth has become most notorious thereby for his villainies. He has therefore incurred not only the wrath of the people but even of the gods . Being despised and detested on sound and just reasons, it is high time the people take to the streets to throw him out lock , stock and barrel. (If the president is to deny the allegations that his daughter, son in law and brothers have not become billionaires , we challenge to bare the assets of theirs before 2015-01- 08 and those now) .